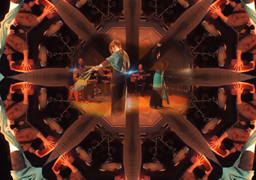 Zyriab's Spirit is a passionate dance and music performance where Flamenco and Arabic music meet and melt into each other. It’s a mystery why so few Western people know Zyriab. Born in the 8th century in Baghdad, he ended up in Córdoba, where he revolutionized music, lifestyle, fashion, furniture and food. In every aspect, he introduced refinement from the Middle East in Europe. Without him, Flamenco would not sound like it does today. Zyriab's Spirit is a show about building bridges, from the 9th century till the 21th, from Bagdad till Córdoba, from the songs of Zyriab till the musical universe of Osama Abdulrasol, Emre Elturco, La Liz, Helena Schoeters & François Taillefer. © 2005-2018 Osama Abdulrasol. All Rights Reserved.